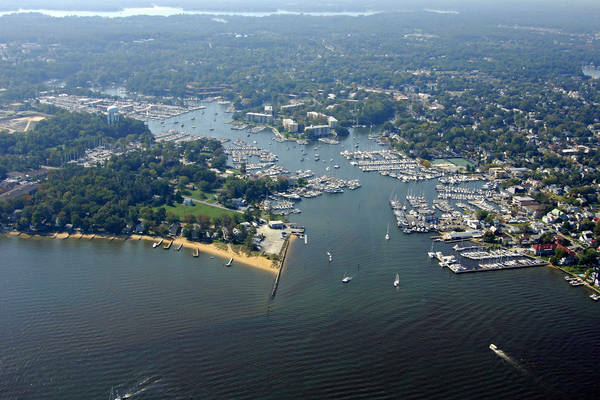 When the first English settlers arrived here aboard a ship in 1649, they found a pristine Chesapeake Bay with an abundance of seafood. From their small, hand-built boats, they gathered oysters and caught fish and crabs to feed their growing families, and grew their own crops. They also grew tobacco for trade. 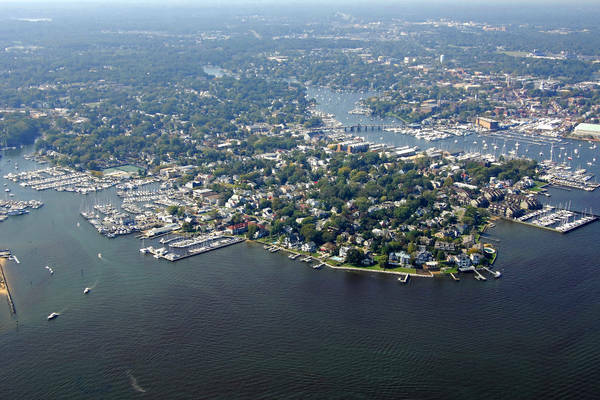 After the town of Annapolis was founded in 1695, it became an important port for shipping barrels of tobacco to England. Sailing ships returned from across the Atlantic Ocean and up the Bay to Annapolis Harbor with an amazing assortment of goods for sale. 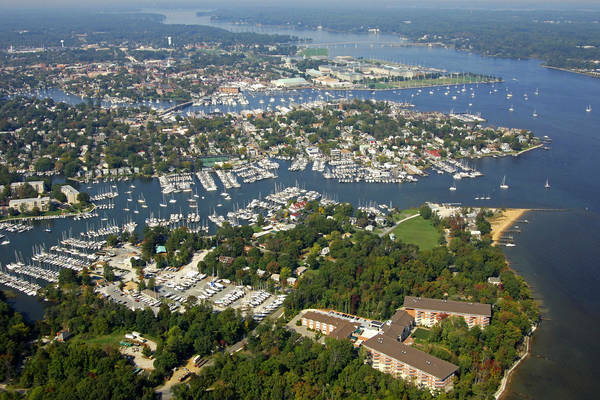 Today, Annapolis is known as " America 's Sailing Capital." Eastport Yacht Club and Severn Sailing Association support year-round racing by high school and college sailors. Major national and international sailing events take place here, including the Volvo Ocean Race. As you can see in the image above, Eastport and Back Creek are all about one thing: boats. 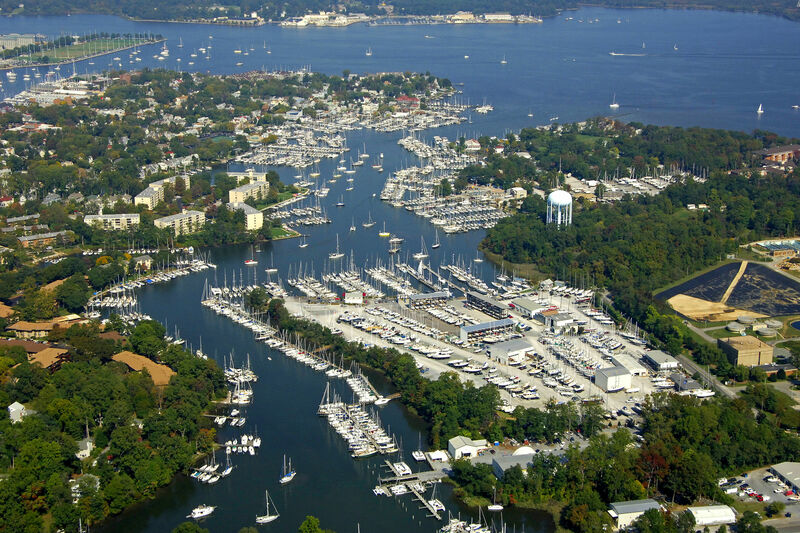 Back Creek is one of two creeks that push their way into the City of Annapolis from the Severn River. 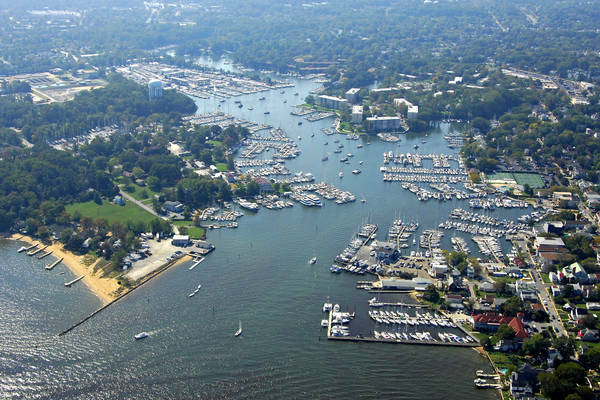 While Spa Creek is home to the prestigious Annapolis Yacht Club, U.S. Naval Academy and downtown Annapolis, Back Creek is home to Eastport (also known as the Maritime Republic of Eastport), the towns maritime and marine industry center. Back Creek lies just south of Spa Creek and Annapolis-proper behind Horn Point and the Eastport Peninsula. Back Creek is the home to several large marinas and yacht yards where literally any repair, refurbishment or upgrade can be undertaken. Sailmakers, riggers, engine shops and haul-out yards line every nook and cranny of the shore. Back Creek is approached from the Severn River, and flashing green 1E sets off the initial approach to the creek. From here, line up with flashing red 2E, and then make sure to leave flashing green 3 to port on the west bend into the creek. 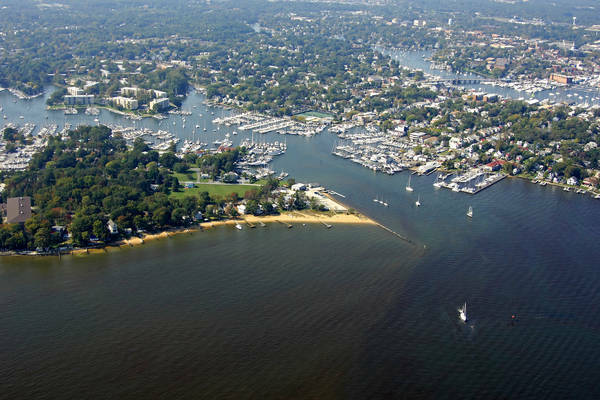 Also of particular note is green daybeacon 3, which marks an encroaching shoal just west of the Annapolis Sailing School. Moorings are available farther up the creek and a limited anchorage area is available in the shadow of the large apartment complex on the north shore of the creek. All street ends on the north shore offer dinghy tie-ups and street access. Annapolis and Eastport are host to many events year-round that revolve around the U.S. 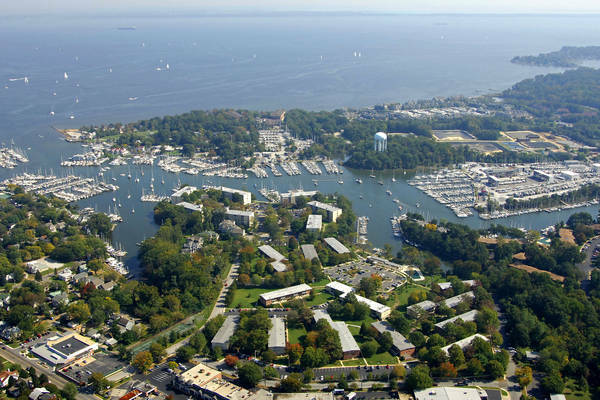 Naval Academy and their rich maritime heritage. A little inside advice will lead you to the downtown harbor areas on the north side of the Eastport Peninsula on Wednesday nights during the summer where the local yacht club races finish right among the moored boats. See the Helpful Links section below for more details. Bus service is available from the City of Annapolis Transportation Department. Routes cover the entire city from Back Creek all the way to the Annapolis Mall. See the Helpful Links section below for detailed route maps and schedules. Baltimore Washington International Airport is only a half-hour drive away from Annapolis and shuttle, rail (via bus connection) and bus service is available from Annapolis. Those wishing to visit Washington D.C, can pick up Maryland (MTA) bus service to the D.C. Metro Rail in New Carrolton at a number of downtown Annapolis locations. See full schedules in the Helpful Links section below. No reviews yet! Be the first to write a review of Annapolis - Back Creek.